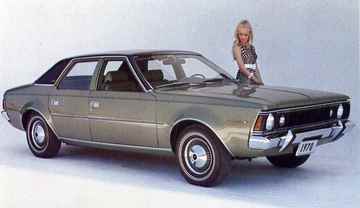 The AMC Hornet is a compact automobile which was manufactured and marketed by the American Motors Corporation (AMC) in a single generation from model years 1970 through 1977. The Hornet replaced the compact Rambler American marking the end of the Rambler marque in the American and Canadian markets. Hornets were also marketed in foreign markets, as well as assembled under license agreements with AMC that included Vehículos Automotores Mexicanos (VAM), & Australian Motor Industries (AMI). The new Hornet became an important vehicle and platform for AMC. It served the company in one form or another for eighteen years, until the 1988 model year. It would outlast all other compact platforms from the competition that included the FORD Maverick, and Dogde Dart/Plymouth Valiant. The Hornet was also the basis for AMC's Gremlin, Concord, Spirit, and the innovative all-wheel drive AMC Eagle.